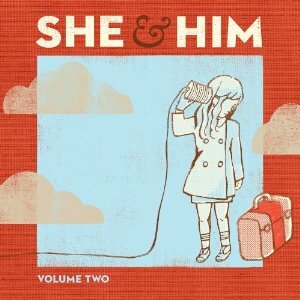 I still listen to She & Him’s first album, Volume 1, all the time. With the aptly titled Volume 2, they’ve moved beyond “Hey, listen to this amazing little side project we made,” skipped right past “We’re here to stay,” and rocketed right on through to “We’re a major force to be reckoned with” without missing a bop or a beat. “She” is lovely and talented actress Zooey Deschanel, who has long been one of my favorite celebrity crushes. The “Him” here is M. Ward, a singer, songwriter, and wildly gifted guitarist and producer whose solo work has rightfully earned him a loyal and eager following. Together, they’re a special kind of magic that combines the best of modern pop sensibilities with the warmth of old-school AM radio intimacy. Deschanel’s delivery on these tracks is most often very matter-of-fact, but she’s constantly, instinctively doing a million little things to give her vocals variety and an earnest sense of knowing far beyond her years. That’s far too rare a talent these days, but she just knows exactly where to go with every moment and word. This isn’t an acting gig where rehearsals are involved, either; the things she does here with her voice come from the kind of instinctual connection to music that you either have or you don’t. We’re lucky that she’s got it so good. The more mellow “Lingering Still” is another of my lyrical favorites: “I like to learn things slow. I like learning a lot. I like to get it all again and in the end you know you get what you got,” and then the chorus is, “And the world’s like a science and I’m like a secret, but I saw you lingering still.” Some of the album’s best backing vocals and guitar work can be found on this one, too. Lots of great string arrangements can be found across the album, and I hear a lot more electric guitar here than on the first one. That extra jig-a-jig-a-jangle goes a long way to making everything so sonically pleasing. Mandolin accents bolster the poppy piano on “Home” as Zooey builds to one of the album’s sweeter ideals: “I could be your state and I could be your nation. It doesn’t get better than home, now does it? I could be your welcome and I could be your greeter, I could be sweet and I could be sweeter. I want to be where your heart is home. I want to see you with the light in the morning. There’s never been such a beautiful warning to me, to me. Why don’t we just sit and stare and do nothing? Nothing at all for a while.” And like an afterthought, she effectively punctuates it with, “I like the way you smile.” Just like that, my heart is hers. After a wonderfully varied mix of faster and mid-tempo tracks, the album ends on two slower notes. “Brand New Shoes” begins with, “I had some brand new shoes. They were all red, but they gave me the blues.” Second verse: “We are all made of air. There’s stars in my eyes and there’s sun in my hair. And I’m running away, it makes me feel better.” Makes me feel pretty good, too. All throughout the album, M. and Zooey make all of it seem so effortless, even though this one really is a lot more lyrically, vocally, and musically complex in every possible way than its predecessor. And yet it never sounds busy or forced. I can’t stop listening to it — it’s a perfect spring/summer album with a heart that will be beating along with mine all year long.